Set of great quality dice (d6) in hard plastic box (15 dice per pack). All dice have round corners. Can be used for different board games, as well as for different wargames including Warhammer 40000 and Age of Sigmar, where you need a lot of dice to play. Dice size 16 mm. Velvet bags with "ADC Blackfire Entertainment" Logo. Size appr. 10 cm x 12 cm. Hot looking black color bags and colored satin lining. Suitable for dice of different shapes. The linings are in red, purple, white, blue or green colours. Set your dice on fire... Blackfire! 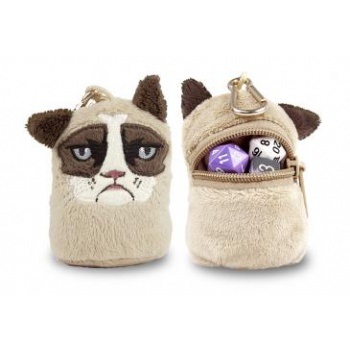 3in Grumpy Cat Dice Bag Cozy is made of soft plush material. Zippered pouch on the back is perfect for gaming dice. Elastic loop and clip.